The ceremony is a rite of passage affirming their role in the school, their houses and their tutor group. Parents are invited to witness this significant moment. In welcoming, them, Chloë Johnson, Chair of the RCL, reminded them that being a Wynberg Girl entails more than wearing the uniform or knowing the school song. It’s in being kind to your fellow Wynberg sisters, respecting the staff, caring for our communities, and enjoying the love and camaraderie in your grade. It’s about really coming to understand our motto of “Honour before Honours” and accepting that those three words represent a lifelong code of conduct: whether you’re in these four walls or out in society, you are a Wynberg Girl and your words and actions should always reflect that. Jessica Stephens our Head of School spoke about all of the opportunities there are for the grade 8s to get involved in at Wynberg and all the incredible opportunities they would be able to receive in the next five years. The Grade Eights were reminded that their orientation programme served as an informal welcome to the school, and that this ceremony welcomed them formally to Wynberg Girls’ High School which we sincerely hope is the ride of a lifetime! 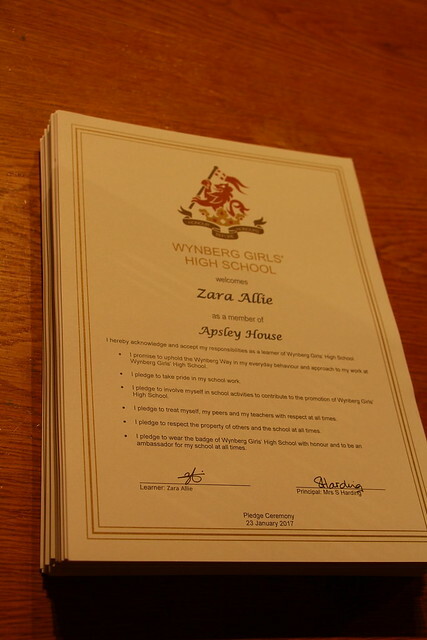 The occasion includes the receiving of a pledge signed by them and the Principal of the school, the receiving of a school badge, individual welcoming into the House and Tutor Group, and for the first time, their earning the right to wear the Wynberg Girls’ High School blazer. They are reminded that they have been chosen as Wynberg Girls out of hundreds of applicants.